Discussion in 'Audio & Video' started by Gieser, Oct 26, 2010.
ok so installed my sub and now the only way i can adjust the power is by turning up or down the bass level. the sub setting on my deck is on and it still does nothing at all. 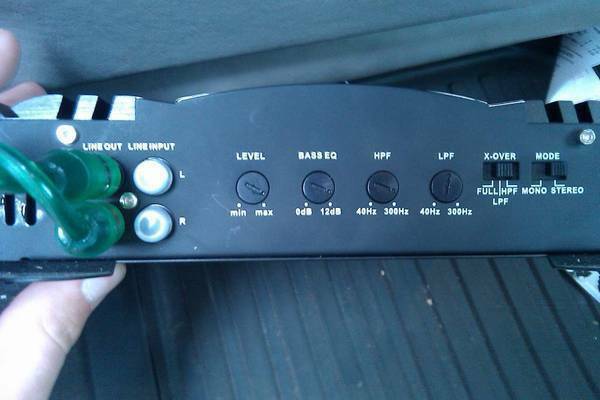 I am guessing that amp is getting its input by speaker level jacks off of your head unit? I am guessing this because Line Input RCA look blocked off. If my guess is right, the sub setting on your Head Unit is not going to work. Normally you hook the amp up with RCA cables from the Sub Out on your Head Unit to the Line Input. Then for a starting spot turn your LPF to about 80 hz. Then adjust the sub level until it blends in with your other speakers by using the level knob. I also recommend turning the Bass EQ to zero db. 2nd - Change your Bass EQ to middle, Next set your LPF (this is what gives you bass) HPF sets your voice and mids sound. Turn your level down to about 1/4 until you have the previous 2 set then you can up the level which will raise the entire sound quality. 3rd - The bridge connection i'm guessing is speaker wire from (+) channel 1 and (-) channel 2 leading to your (+) and (-) of your subwoofer correct? so if i plug the rca cables into the other ports it should work? and yes ill make the other ajustments suggested. its only an 8" with a jenson 400 amp. 1) As others have said, put the RCA's where it says "in"
4) Turn that bass EQ dial all the way down. 5) Set the Level to the point where it blends well with the system. put the RCA's where it says "in"
did all this just now with no change. got no idea what it is now. any suggestions. we need to see the other connections... is the sub or amp even turning on? Touch the cone and confirm you can feel it moving. I would also switch it from stereo to mono in you are only running one sub off it. You were getting sound from the subwoofer when the RCA's were plugged into the OUT section? That just doesn't make sense.